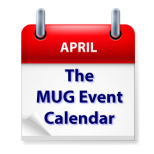 Terry White headlines this week’s MUG Event Calendar with a presentation on Adobe photo apps at his Michigan group, while a California group will discuss the Digital Revolution and a Pennsylvania group will hold their annual Spring auction. Other topics on this week’s agenda include iTunes, OS Basics, Final Cut X 10.2 and favorite iOS apps. Los Angeles Creative Pro Users Group – "FCP X 10.2" – We welcome back Sam Mestman, Workflow Architect – FCPWORKS. Sam will demo FCP X in a shared storage environment. Sam will also demo and take questions about the new features in FCP X 10.2 Also "FOCUS" editor Jan Kovac will be joined by Shot Notes X developer Kevin Bailey. They will show how they updated the FOCUS workflow with Sync-n-link and how they incorporated Shot Notes X.
Sunday 26-Apr MacGroup-Detroit – Terry White on "What’s New with Photography and Adobe"